Chuck Goudie and the ABC7 I-Team have uncovered apparent threats against several prominent Democrats on social media sites allegedly linked to mail bomb suspect Cesar Sayoc. 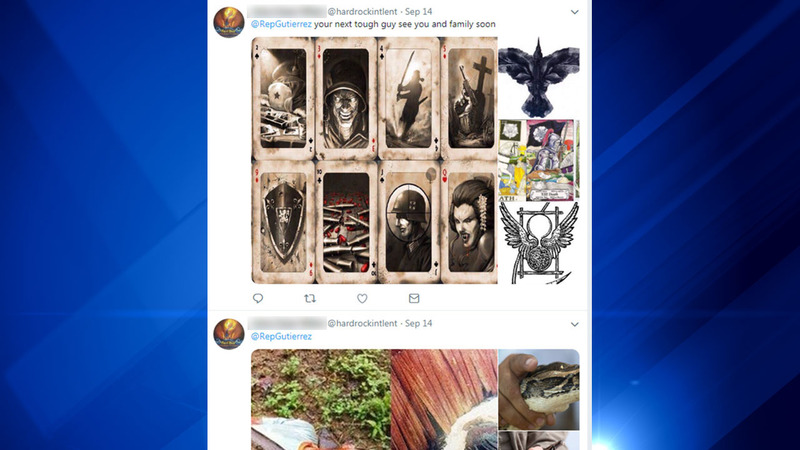 CHICAGO (WLS) -- A South Florida man arrested in a series of suspected package bombs appears to make threats against IL Congressman Luis Gutierrez on a social media account that seemingly belongs to the suspect. 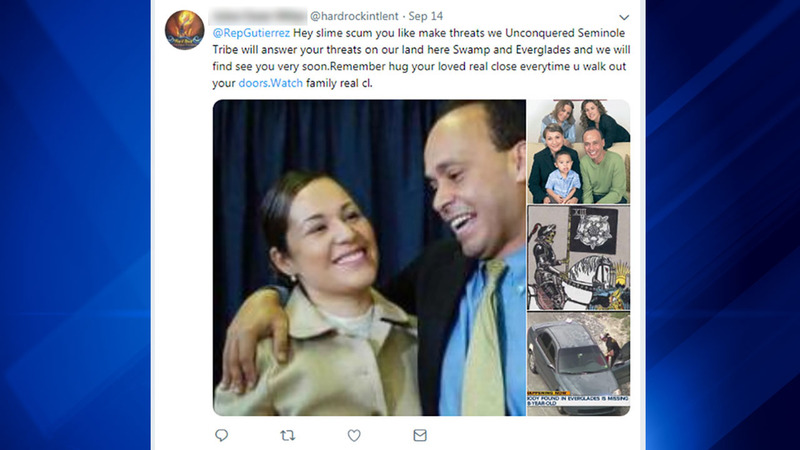 Social media images on accounts uncovered by the I-Team including the Twitter handle @hardrockintlent appear to show Cesar Sayoc threatening Gutierrez and his family. A second Twitter account with the handle @hardrock2016 has been identified by the Department of Justice as likely belonging to Sayoc. @hardrock2016, the account named in the newly released criminal complaint, follows @hardrockintlent. The two handles share the same bio photo and have similar cover photos that appear to show Sayoc. In one of the posts from September, the handle writes, "Hey slime scum you like make threats we Unconquered Seminole Tribe will answer your threats on our land here Swamp and Everglades and we will find see you very soon.Remember hug your loved real close everytime u walk out your doors.Watch family real cl." 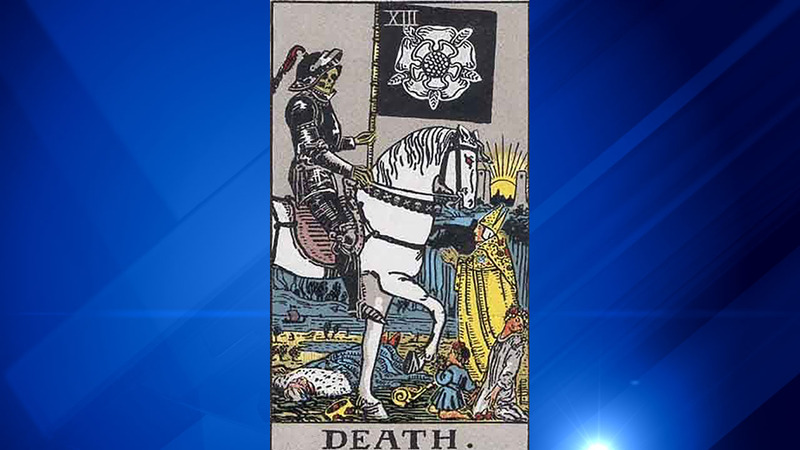 That post features pictures of Gutierrez's family and what appears to be a Tarot "death" card. Another September threat with a playing card that shows bullet jackets says "@RepGutierrez your next tough guy see you and family soon." When informed by the I-Team of these apparent social media threats, Gutierrez's office seemed to be unaware of the Twitter posts. A spokesman for Gutierrez, Douglas Rivlin, told the I-Team "we are very pleased someone is in custody" and that their office has talked with the U.S. Postal Inspector and Chicago Police Department about this week's campaign of suspected mail bombs. They say they've "searched their database of people who have written and emailed the congressman and did not find" Sayoc's name. The apparent threats against Gutierrez are part of a extensive list of social media threats targeting numerous top democrats and CNN. The apparent threats stretch over the past year and contain similar language and photos against various individuals. The Seminole Tribe of Florida says in a statement, "We can find no evidence that Cesar Altieri, Caesar Altieri, Caesar Altieri Sayoc, Ceasar Altieri Randazzo (Facebook) or Julus Cesar Milan (Twitter) is or was a member or employee of the Seminole Tribe of Florida, or is or was an employee of Seminole Gaming or Hard Rock International. At this time, we cannot verify if he is or was an employee of a vendor company."